The International League revealed its projected roster for next month's Triple-A All-Star Game on Wednesday, showcasing a squad assembled by votes of fans, media and team field staff. Durham Bulls manager Charlie Montoyo will lead the International League All-Stars on July 14 in Allentown, Pa., when the IL's best face off against the Pacific Coast League All-Stars at Lehigh Valley's Coca-Cola Park. Fans were able to vote online to send their favorite players to the game for the past month. Thirteen players were elected as starters for the game based on voting from fans and managers. Montoyo will have a choice of who starts the game on the mound between a pair of Charlotte Knights: Dan Hudson or Carlos Torres. It'll be hard for Montoyo to make the wrong choice, with both Hudson and Torres having terrific seasons down south. Both pitchers are in the IL's top four in strikeouts, Hudson with 97 and Torres with 92. Hudson is also tied for the league lead with 10 wins. Torres is seventh in the IL with a 3.04 ERA. The Knights' Tyler Flowers will be behind the plate, joining a pair of hometown favorites in the infield, IronPigs first baseman Andy Tracy and teammate Cody Ransom, a third baseman who began last season in the Majors with the Yankees. Scranton/Wilkes-Barre's Eduardo Nunez and Louisville's Chris Valaika form the IL's double-play combo. Dan Johnson, who leads the league with 18 homers and 63 RBIs, will start as the designated hitter. The Durham slugger is batting .299. Michael Brantley (Columbus), Jeff Frazier (Toledo) and Dustin Martin (Rochester) were elected starters in the outfield, and Scranton/Wilkes-Barre closer Jonathan Albaladejo will join Lehigh Valley's Scott Mathieson in the bullpen. Albaladejo has had a near-perfect season so far, with 24 saves and a 1.17 ERA in 33 appearances for the Yankees. The rest of the roster was selected by the league office, with at least one representative from each club making the trip to Allentown. Host Lehigh Valley will send four players to the game, and Charlotte and Durham will boast three each. Yankees top prospect Jesus Montero was selected a reserve catcher, along with Indianapolis' Erik Kratz. Durham infielders Joe Dillion and Elliot Johnson will be reserves, as will Gwinnett's Barbaro Canizares (INF) and Michael Dunn (P). Nate Bump (Lehigh Valley), Chris Tillman (Norfolk) and Pat Misch (Buffalo) are a few reserve pitchers who have each spent time in the Majors. Montoyo will be joined by Lehigh Valley manager Dave Huppert and Indianapolis skipper Frank Kremblas in the dugout. The most notable player absent from the roster is Buffalo veteran Mike Hessman, who is tied with Johnson for the league-lead with 18 homers. Editor's note: The International League removed four players from the preliminary roster on July 5. The players include: Michael Brantley (OF, Columbus), Joe Dillon (INF, Durham), Tyler Flowers (C, Charlotte) and Cody Ransom (3B, Lehigh Valley). On July 6, the IL added Wes Timmons (INF, Gwinnett) to the roster. On July 8, the IL removed Robert Manuel (P, Pawtucket) and Travis Wood (P, Louisville). 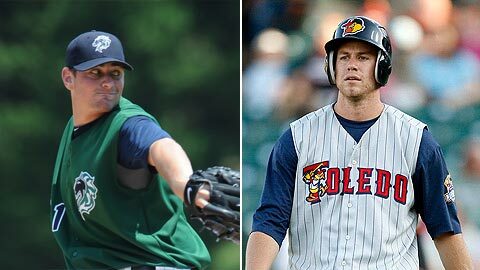 On July 9, the IL replaced Chris Tillman (P, Norfolk) with Josh Tomlin (P, Columbus). On July 11, the IL removed Dan Hudson from the roster.